Home Windows 8 What you Lose When you Upgrade to Windows 8 From Different Windows version? What you Lose When you Upgrade to Windows 8 From Different Windows version? Windows 8 is now hot topic on the internet World. Most of the windows users likely to upgrade their previous Windows version to Windows 8, because of some useful new features like Apps, touch screen supports etc. Are going to upgrade your Windows PC to Windows 8? Wait a minute before you must know what you lose when you upgrade? Windows 7: When you upgrade from Windows 7 PC there is nothing problem. All your personal files, Apps and Windows settings automatically transfers to Windows 8. Vista : If you upgrade from windows Vista you will lose all installed apps from your PC but your computer keeps Windows Settings and your Personal files. You have to re install apps. XP : Will lose Windows settings and Apps keeps your Personal files. 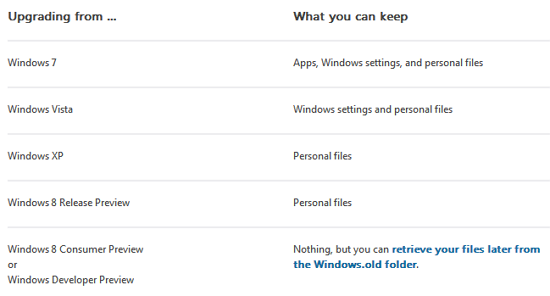 Windows 8 Release Preview: When you upgrade form Windows 8 Release Preview it only keeps your personal files. So you will lose all your windows settings and Apps etc.